The year is 1970. In a blue-collar suburb of Boston, two eleven year-old Catholic girls struggle to come of age in a culture still very much dominated by men. They watch in dismay as their fathers and priests determine the lives of the women around them. Loyalty to family and church is paramount; women and children suffer in silence rather than expose the men who do them harm. Frances Orillio is an adopted, only child; she is self-critical, anxious, and vulnerable. Maddy Malone is one of six children, and grew up in a rough housing project scrapping with the boys. Although they are strikingly different in temperament, they forge an enduring friendship on the path to becoming strong, independent women. Together they battle the tangled jungle of ignorance, racism, and homophobia that goes hand in hand with the culturally entrenched discrimination against women. Like the treacherous roads in a New England winter, the way is fraught with hidden dangers. Family secrets and lies are like the invisible black ice on a bridge: if you don’t watch out for the signs, it can be deadly. 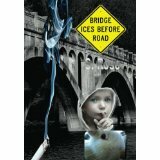 “Bridge Ices Before Road” by Sienna Rose was given to me by the author for an honest review. It is a lovely and heart warming book, telling the story of two twelve-year-old girls in a suburb of Boston as they grow into adulthood in the 1970s. Frances is adopted by an Irish-Italian (Catholic) couple and an only child. The book is told from her perspective, showing brilliantly her manifold thoughts and feelings as she moves from one episode of her life to the next: Her ambiguous feelings towards her dead grandmother, teenage anxiety and her lack of confidence, most of which come from the harsh Catholic upbringing she is exposed to. Threatened by her mother to be returned to the orphanage, bullied at school and told to do as she is expected without being explained why Frances is struggling her angst and confusion with life in general. In almost humorous and empathetic ways the author describes how Frances is influenced by her upbringing, her peers and the changing society in the 1970s and makes up her own mind about the issues of the time: Racial segregation, equal rights for women and homosexuality to name a few. Her struggle to form her own identity, particularly as a child of a mixed marriage and being adopted, the double standards in her family and the fear of God are alleviated when she becomes closer to her cousin Maddy and finally has an ally. I fell in love with the voice from the first page onwards, a gentle, honest and confused child to whose thoughts and ideas I – also a Catholic child from the 70s – could very well relate. The growing conflict between the sexual revolution in parts of society and the repressed attitude towards sexuality run through the book prominently from when Frances has her period, to sexual orientation issues around her and her own first date. The author examines those episodes in detail and makes us see exactly how Frances feels about the conflicts on her mind; I challenge anyone to not care for these girls in their struggle, particularly since the two are never just victims but fighters who work hard to become strong and independent women. The book is so rich with details and examples of the issues prevailing at the times; those very questions were discussed on my German dinner table in the same way as in the circles of those blue-collar families in Boston. The story takes us back with remarkable authenticity and insight. For me it was a travel back in time and I found many quotes in the book that expressed exactly how I felt in those days which I had completely forgotten. I was amazed, saddened and entertained by the experience and pleased with the way the story developed. For others it should be a great learning experience and an accurate and balanced view into the mind and psyche of the children of those times. I feel the story is also a showcase of the subtlety of intolerance and a reminder of the slow but steady progress of society. It renewed my optimism, seeing how far society has come indeed since those days. The friendship between the two girls is charming and refreshing and the prose in its simplicity is perfectly suited to the voice of a growing young woman. The author possesses a sensitivity and psychological understanding that makes this book truly magnificent with two characters that I wish were my friends in real life. Sienna, tell me, how did you come to writing? Was it something you always wanted to do or is it something that came later in your life? “This didn’t come from in here!” she barked, while poking my head sharply with each word. “Get out!” she shouted at the top of her lungs. Her face was red with anger. I wish I could say that my defiance buoyed me, but I was sick at heart. I never saw my poem again; I kept the episode a secret from my parents, afraid they would agree with the teacher. I never wrote another poem or story, until later in sixth grade when we learned about haiku and we were assigned to write one. I studied psychology in college and confined my writing to expository papers. I was so engrossed in my major subject that I tested out of English 101 and 102 and took extra psychology courses. My college advisor told me I was a fine writer and should write books-I think she meant novels-which confused me since I wanted to be a psychologist. Over fifteen years later, I acted on her suggestion. When did you first have the idea for this book? What can you tell us about your connection to the themes in the book – other than being a child of that generation? When you are lucky enough to live past 50, in good health, you get to thinking about things differently. It’s like climbing a mountain: at each level you get a view better than the next and see farther. I suddenly felt like I had a great deal of understanding about how people tick, both from formal study and personal experience. I wanted to share it. If I wrote about the intersection of genetics, environment-both familial and cultural, gender, race, and how the personality is formed, some people might read it I suppose. This way I sneak in some education in the guise of a novel, for all of the personalities are plausible and psychologically valid. One of the themes- children struggling with hidden disabilities- is something I encounter in my work: I’m an independent educational consultant and advocate for children with disabilities. The same misunderstanding and blame that took place in school when I was a child in the 60’s and 70’s is, remarkably, still taking place today. I hope even a few readers will encounter the problem for the first time in my novel, and gain new understanding for these children. In the days after Obama’s election and gay marriage discussion your book reflects many issues of contemporary political relevance. Is that coincidental? Do you write about the past or also about the present? There are two answers: 1. About two years. 2. Fifty years. Both are true, because I couldn’t have written it until now, and I spent two years putting it into MS Word. Did you have to do any research or was your memory enough? I quickly looked up a few details like when the draft ended, and a bit about a kind of fire engine. Other than that, I capitalized on fifty years of memory. Many of the funny stories came directly from my life: when you had a drunken grandmother who sprung around the living room on the pogo stick that you just got for Christmas, that’s gold! Which one of the characters would you say is your favourite and which one is the most like yourself? Maddy Malone is my favourite; she has the heart of a lion and the courage I wish I had. I do think I possess her loyalty to people. Outwardly, I am much like Frances, but she is still a work of fiction. Many of the defining events in her life did not happen to me. Who would you like to play the characters in a movie? Would you like it to be a movie? I not only want Bridge Ices Before Road to become a movie, it’s my greatest wish! So far several reviewers have volunteered the opinion that it would make a good movie. I don’t have anyone in mind to play the characters; I would want some young aspiring actresses, unknown but with great talent, to take the lead roles and make the story live. I wouldn’t be able to write at all without MS Word and my laptop. I admire all those who had no choice but a pen. My environment is very quiet, all alone in my home with my dog, my parrot named Dante, (he’s an unusually quiet bird) and my fish. I love to watch my saltwater reef-tank. I can’t bear most modern music, and in any case I couldn’t write and listen to the music I do like (classical and opera). I can’t begin to remember. I rewrote some parts extensively, while others came off right nearly the first time. I had no editors. For better or worse, I controlled the quality by reading many times, at least fifteen times through the whole novel, and many sections I read even more. A friend alerted me to some misspelled homophones. Other than that, I did every bit of it alone. I’ve written the first five or so chapters of another novel from the perspective of even younger girls. All I can say is it’s quite different, and I’m not even fixed on the title. I’ve been encouraged by my first dozen or so readers so far to keep writing, which is very kind of them. When I have something ready, I’ll publish it on Amazon. I enjoyed D. H. Lawrence’s Sons and Lovers, and Women in Love. Pearl Buck’s The Good Earth. I really read a lot of the classic novels and not so many recent “best sellers”. My favourite book I share with a great many people: Harper Lee’s, To Kill a Mockingbird. She is my greatest inspiration, in that she also wrote a first novel that was and still is great. She had a story burning inside, and holed up until it was written. It is a genuine and heartfelt effort, and stands strong against the test of time. The novel employs all the beautiful elements of fiction that makes writing fiction an art form: imagery and symbolism that also serve to foreshadow events to come in a metaphorical way. What is the main message of the book in your view – if you can say so without spoiling the reading experience?